The rich are still getting richer in the U.S., with the wealthiest 10% controlling three-quarters of all family wealth in the country. U.S. family wealth totaled $67 trillion in 2013. But slices of that pie were far from equal, according to a report released Thursday from the Congressional Budget Office. 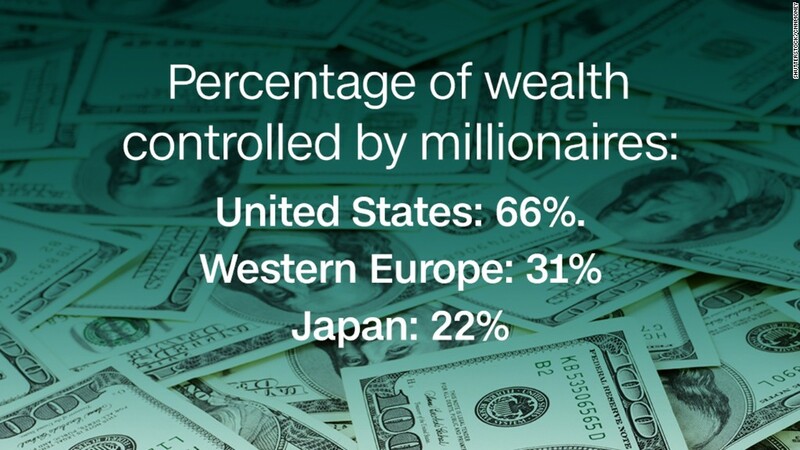 The top 10% of families -- those who had at least $942,000 -- held 76% of total wealth. The average amount of wealth in this group was $4 million. Everyone else in the top 50% of the country accounted for 23% of total wealth, with an average of $316,000 per family. That leaves just 1% of the total pie for the entire bottom half of the population. The average held was $36,000 for families that fell in the 26th to 50th percentiles. But if they fell in the bottom quarter, they had zero wealth and in fact, were $13,000 in debt on average, CBO found. Age and education made a difference in wealth accumulation. Not surprisingly, wealth was higher for households headed by someone 65 or older. Median wealth for these families was $211,000, or almost three-and-a-half times higher than the median for households run by someone 35 to 49. Families run by adults with college degrees, meanwhile, had a median wealth of $202,000, or nearly four times that of families headed by someone who only had a high school diploma. Changes in wealth over time was also very uneven across groups. Families at the 90th percentile saw their wealth grow by 54% between 1989 and 2013. Those at the 50th percentile only experienced a 4% rise during the same period. And those at the 25th percentile actually saw their wealth drop by 6%. What's more, the top tenth of families saw their share of the total wealth pie grow from two-thirds to more than three quarters over the 25-year period, while everyone else saw their slice shrink. The CBO analysis looked at what it called "marketable wealth," which are assets that are easily traded and have value after someone's death (e.g., real estate, stocks, bank accounts, 401(k)s and equity in a business). From those assets it subtracted nonmortgage debt (e.g., credit cards, auto and student loans). Much political discussion has focused on income inequality. Income is critical but it is not the only part of the wealth equation. The recession from 2007 to 2009, which hit investment and real estate values hard as well jobs, took a bite out of everyone's wealth. "During and after the recession, wealth declined for all groups, and by 2013 no group had regained its prerecession level," the CBO noted. But those at the top saw their wealth decline the least -- by 7% between 2007 and 2013, compared to percentage losses that were three to six times greater for everyone else.